The Basic Bungalow is the least expensive model we offer designed with the budget-conscious in mind. This model is a one story studio style tiny home with living and bedroom combined on an 18ft trailer. 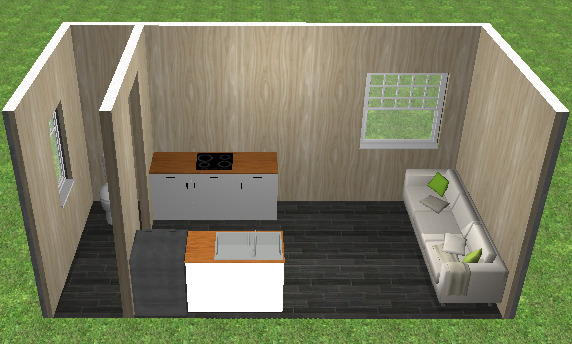 To keep the costs down, some of our standard features are different from the rest of the models: Wall AC Unit, Vinyl flooring, 4x8 unfinished plywood walls with moulding, 2-burner cooktop, and mini fridge. Although some of the materials are different, the high quality build is the same as the rest of our models.